The 8-mile loop above Genoa, Nevada. Multiple trailhead possibilities, good climbs, and waterfall reward at Genoa Canyon. 1,400 feet gain with some quick descents along numerous switch-backs. Connects to several other trails, including the Tahoe Rim Trail via Sierra Canyon. 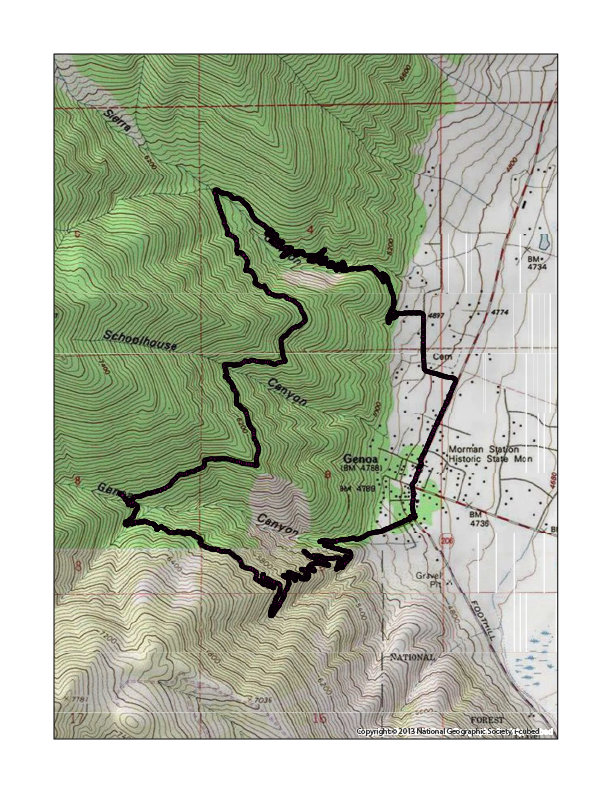 Trails: Van Sickle Down, Spooner Out&Back, Genoa Loop — 19.5 mi; 4 hrs, 13 min; 2,621 ft gain. It’s time to get some regular trail time back in the mix. My trail rejuvenation and training has been hit-and-miss this year; it’s really been lacking since my running of Tahoe Rim Trail 50 last year, though I had some nice Winter Trail Series runs early in 2018. So, with motivation from Darren and Robert, who are running the Tahoe Rim Trail 100 next weekend, and considering I might get to accompany one of them as a pacer, it was time to lace ’em up and hit the single track. The summer heat is in full force with most days in the high 90s (or more), and that’s not the best time to jump back into trail training. And, of course, I’m older and less fit, so I can’t get discouraged by feeling slow and stumbly. I’ll work back into it. I’m not targeting any particular race or heralded goal, I simply want to get back on the trail, clear the cobwebs from the body and mind, and keep it going. 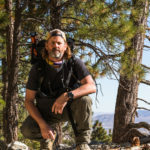 Maybe I’ll start thinking about finishing the Desolation section of the Tahoe Rim Trail in the fall, that could be good and practical motivation–I’ve yet to complete the Tahoe City to Echo Lake section of the wonderful circumnavigation of the lake. With each afternoon at peak temperature, I decided it best to get up back up high. It is a bit of extra drive time to get up to the TRT, but the degrees fade with elevation and there’s usually an afternoon breeze to cool things somewhat. It sure beats the scorched trails of the valley bottoms. Plus, I hadn’t been on the TRT in almost a year, crazy as that seems to me. It’s time. I got started with a short climb from TRT’s South Kingsbury Trailhead, soon veering onto the Van Sickle Trail, a route I’d never taken before. I thought it better to start confidently with a long downhill (though it hurt the next day). Better yet, Des could meet me at Van Sickle Bi-State Park at the California-Nevada line at South Lake Tahoe, and I could do a little point-to-point along the simple downhill. It’s a really nice trail with some open views of the lake. I had to be a bit careful because it’s mildly technical and rocky in a few places, and I was well out of practice. My 12-minute pace wasn’t impressive, but so happy to be up here and on the trail again. I followed up Thursday with an out-and-back jog at Spooner Trailhead, dropping to the Marlette Lake Trail for a few miles. I good still feel Tuesday’s downhill, but, again, this is a good thing. For the weekend, I thought I top off the week with the good 8-mile loop that is the Genoa Trail. The trail weaves in and out of east-facing canyons and I got a bit of a late start. The mid-morning temperature wasn’t unbearable, but the oven of the canyons and the exposed ridges was ever-present. I climbed slowly and felt steady, even though it had been one of those mornings where I had to dig deep for motivation to get out the door and keep the training going. Somehow, those pre-run feelings of low expectations often translate into an enjoyable run. I didn’t break any records, and won’t be breaking any old records for a while, but I can already feel the rewards of mental relaxation and the small success of a return to the trail. I’ll look forward to the coming week and a possible night-time adventure on the TRT.